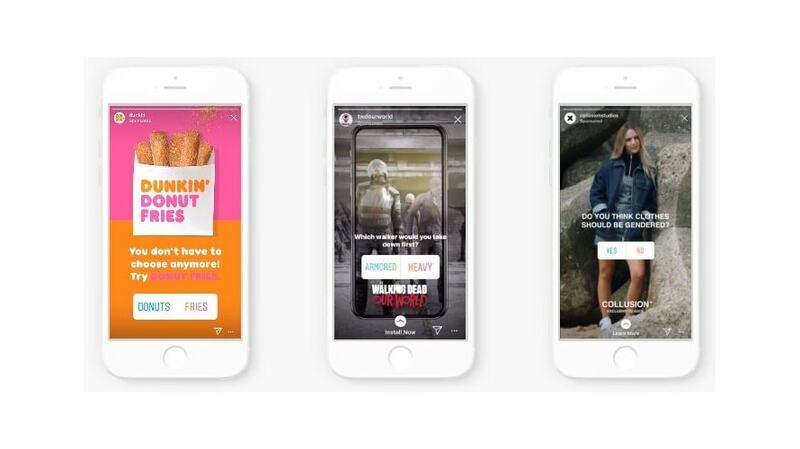 Coming off the tail-end of the in-app shopping launch, Instagram is bringing the poll sticker functionality to its Stories ads, delivering its 500 million users who use Stories daily a new way to interact with brands and ads. Instagram Stories ads are a way for brands to share photos and videos with their key customer audiences to generate awareness or drive action. The poll functionality allows companies to build connections with their audience by asking questions within the ad itself. Brands are already seeing the positive impact of using the poll stickers in their ads. Nine out of 10 beta campaigns testing the poll sticker saw an increase in the number of three-second video views. Specifically, Dunkin’ experienced a 20 percent lower cost per video, while Next Games saw a 40 percent increase in app installations. Asos tested the polling feature in an effort to promote its new unisex fashion brand, Collusion. For the brand’s first ad poll they asked their customers if they thought clothes should be gendered, making customers feel like they’re part of the brand story while providing Asos with insight into their customer sentiment. For companies, not only does this interactive feature encourage ad consumption and engagement, but it allows them to collect real-time data about their audience. Users now have an additional touchpoint for interacting with brands, and have an enhanced opportunity to provide feedback and collaborate with their favorite brands. No longer are ads speaking to consumers, but instead, they’re pulling them in by including them in the ad experience.